Straight from an American designer; gorgeous polished Sodalite 'donut' set in a substantial 925 sterling silver ribbon-style mount. So called because it is a Sodium rich stone, Sodalite is often mistaken for Lazurite or Lapis Lazuli, but it is a royal blue rather than ultramarine in colour. Sodalite also rarely contains pyrite, a common inclusion in Lapis. It is further distinguished from similar minerals by its white streaks or patches. 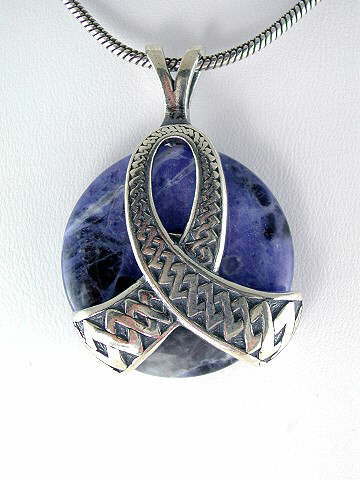 A very useful stone for the mind, Sodalite can assist in creating order out of mental confusion. If worn whilst meditating it can help us understand why we are in any given situation and to discover the lessons needed to learn to progress. It is protective and works extremely well with the Third Eye or Brow chakra and is said to be especially useful for the over-sensitive personality where phobias, fear or guilt are present.